Visit https://podnews.net/update/podcasting-countries for all the links, and to subscribe. 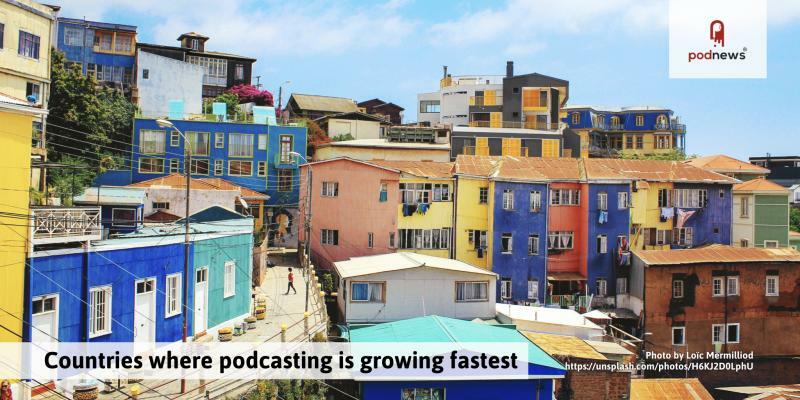 Voxnest have posted the fastest-growing countries for podcasting. The top 4 are Spanish-speaking, all in Latin America. Number 5? China, growing at 43% month-on-month. Given that China has a population of 1.4bn, that's a significant increase for total downloads. Swoot, a new social podcast app, has been launched: you can see friends listening to shows. 25% of podcasts played by users, says the press release, are influenced by friends. Dan Misener had his independent podcast Grownups Read Things They Wrote as Kids featured on Apple's front page. In a blog post he explained how he got there, and what effect it had on his traffic. Patreon changes pricing for new creator plans soon - you have until May 6th to join to retain the old pricing model. Headliner have published results of a test showing that posting audio and a moving waveform performs three times better than a static image. The Wondery/UMG announcement we reported on yesterday might have something to do with the disappearance of some Wondery podcasts, including One Plus One 's exploration of the relationship between Lennon and McCartney, and the Death Row Records vs Bad Boy Records episodes of Business Wars . The reason? Music rights. Visit https://podnews.net/update/wondery-omg-umg for all the links, and to subscribe. 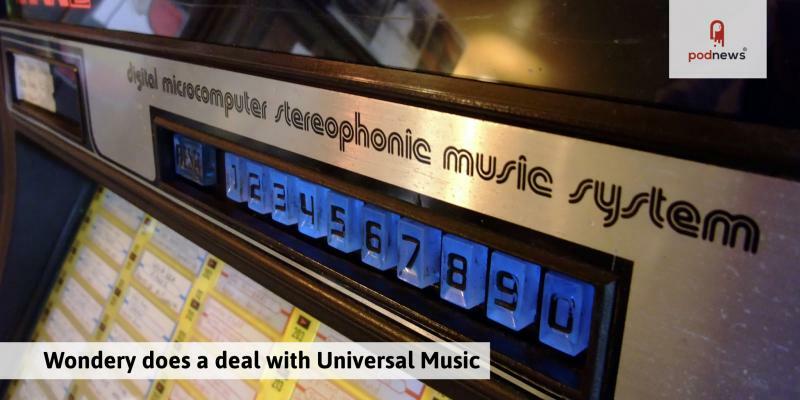 Universal Music Group have partnered with Wondery "on audio stories that could later be developed into films or TV shows"; the deal reportedly means that Wondery can use UMG's music catalog in its podcasts. This doesn't, quite, mean that Wondery can start using all the songs it likes, though: UMG owns the recordings, but typically not the publishing rights for the songs, which would also need to be agreed. As one example: the UK rock band Queen are on a UMG label, but their song publisher Queen Music Ltd is owned by Sony/ATV. Here's how to use commercial music in your podcasts. Earshot Strategies writes, critically, on the decision by the BBC to pull its podcasts from Google. A pop music critic for the Washington Post posts a clickbaity article entitled Are podcasts killing music or just wasting our time?. The article (which does contain some useful points) has been widely reviled on social media, probably doing exactly what the author wanted; Helen Zaltzman has an especially cogent take (and the comments seem to agree). If your podcast was submitted to Spotify by your podcast host, you may have looked enviously at those who have direct access to Spotify's analytics, which contain demographic details and more information. You can now see that, too: just add your podcast and you'll be able to see your stats; you need access to the email address in your RSS feed. Omny Studio - featured in WIRED magazine this month - have written about their transcription service, and the benefit of it. They also show off their "transcript player". Vox Media has purchased Epic Magazine. Spreaker, a podcast host, have announced a one-click publishing service for their clients, and a few more tweaks. Neilsen have published a blog post about podcast advertising, noting that audiences think podcast advertising is a good fit with the content. A British record plugging service ("pluggers" go out to radio stations and convince them to play songs) has launched a new podcast plugging service, matching artists with podcasts "that best meet their strategic needs". We Edit Podcasts has written a good - no, excellent - list of top 14 podcast blogs. Happy Birthday This Week In Tech , which is 14 years old. Leo Laporte and the team have posted their very first episode, then called Revenge of the Screensavers, on YouTube - oddly, acted out by puppets. I manage podcasts for an NPR member station. I’m thinking of changing all our language to “follow.” It solves the listen-one-time vs listen-from-now-on problem, but still sounds free. I think "Follow" actually makes a lot of sense. More so than Subscribe or Listen. Particularly when you realize that people "subscribe/follow" a lot of shows and only selectively listen to episodes that either look interesting or come from their absolute favorite shows. ...we'd note that "follow" is language also used by Spotify (in some user interfaces), as well as iHeartRadio. If you have views on anything we cover, hit the reply button. We've added magic QR code links to our podcast links pages ( here's an example ) which, when scanned, open either Apple Podcasts or Google Podcasts automatically. Good for business cards, if you think people know what to do with QR codes. Visit https://podnews.net/update/podcast-crash for all the links, and to subscribe. 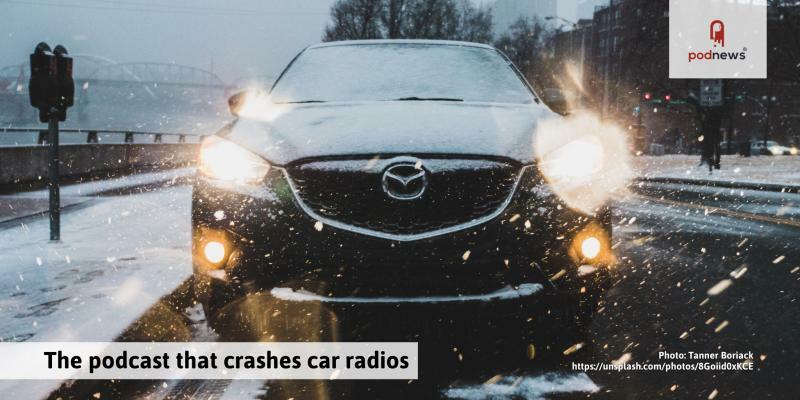 Play 99% Invisible in your Mazda or Nissan, and your radio might crash, according to a recent episode of Reply All . Both Podcast Addict and Pocket Casts have now been patched to stop this from happening; and on Reddit, the person who noticed it, a guy called Ben, pops up with more detail of the bug: and in the comments, a solution... it turns out that characters like %In (along with %jn and %hhn) cause the issue (it's an "uncontrolled format string", apparently). Zach Kahn has spotted that Apple Podcasts has much better browsing functionality in the latest beta version of iOS. "It makes it that much easier to discover new shows", he adds. TMZ is reporting about a legal matter between Chris Hardwick and Cadence13. Hardwick didn't make an episode of ID10T between mid-June and mid-November , which TMZ claim is in breach of contract. The website also reports that Cadence13 has made about $394K in ad revenue from the show. Digiday reports on podcasting's pivot to paid. The report claims that Luminary reached out to 160 podcast creators, and has signed deals with 54 of them. Caroline Crampton has launched a newsletter called The Listener, "where I curate and send out three amazing podcast episodes every day". Our link goes to a free month's subscription, and a way to get your podcast in the newsletter. (We also list more podcast recommendation newsletters). Meanwhile, The Daily Goody is a short daily newsletter with a new tip each day to help podcasters make better podcasts. SiriusXM is now packaging talk shows as podcasts, exclusive to Pandora (who they own). Steve Pratt believes that there's a better metric for podcasting than downloads. The host of Earshot , a radio promotion and imaging podcast, has gleaned some useful learnings from Spotify's analytics. Podcoin, an app that pays people to listen to podcasts, now apparently has 10,000 daily users. "Podcast owners can claim their podcast for free by filling out a simple form to prove ownership." Significantly more people use YouTube than listen to podcasts, and they all seem to cope with the word "Subscribe" just fine. They realise that by hitting the "Subscribe" button, they'll hear about new episodes as they're uploaded. There's no implication that it'll cost anything. I used to think that "Subscribe" might have connotations about paying money, as in a newspaper or magazine subscription. But (sadly) few of today's Millennials and Gen Zs have ever paid for such a subscription. Visit https://podnews.net/update/daily-weekly for all the links, and to subscribe. Michael Barbaro and Lisa Tobin from The Daily are the subject of a long piece in The Hollywood Reporter, as they gear up for The Weekly, a 30-episode season on FX and Hulu. It launches in June. Network 10, an Australian television network owned by CBS, has released its first podcast. The Professor and The Hack is the first from the company's 10 Speaks division, and is a political podcast coinciding with the recently-announced Federal Election in the country. It isn't, yet, in Apple Podcasts, though. Megaphone post about the Apple Watch, calling it podcasting's stealth success story. Advice: 3 ways to build and keep your radio or podcast audience from Backstage magazine; JAR Audio looks at ideal analytics for branded podcasts; Billboard highlights what makes a great podcast studio; and Brett Schafer examines Spotify's podcast analytics. Spotify is using Instagram to advertise its podcast content in Canada. Featured podcasts include Canadaland , Frontburner and The Daily . Google Podcasts appears to have many BBC podcasts back again: this time, via republished RSS feeds on Feedburner. Meantime, explore topics you have listened to is a new section of the app, leading you to Google searches about podcast topics you've listened to, and an auto-generated popular with listeners of Podnews panel appears to suggest... well, we're not sure what to think. Now that the website link has disappeared from Apple Podcasts pages, we (again) wonder about the validity of the BBC's removal of their podcasts from Google Podcasts. There were a few opinions yesterday on the problem with the word "subscribe"; Podnews just prefers to use the word "listen". “Listen to this podcast” sounds like you’re asking people to hear one episode. “Subscribe to this podcast” sounds like you’re asking people to hear all your episodes as you publish them. I’m sure there’s a better solution. I’ll work on that. 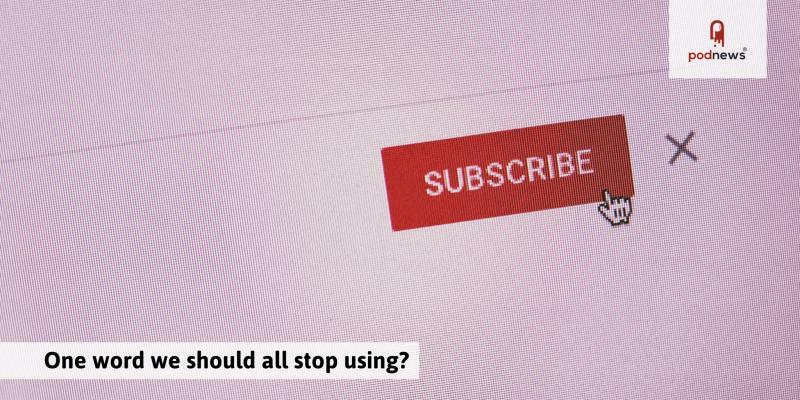 I think "Subscribe" (used with one simple change) can be even more enticing and helpful than "Listen" when providing instructions to listeners. Subscribe (free) on Apple Podcasts. Subscribe (free) on Google Podcasts or An Android app. I think "Subscribe (free)" is better than "Listen" bc you want to instruct them to find and click "Subscribe" rather than just seek out a play button on each episode and "Listen" (and not Subscribe). I hope that is a helpful perspective. Thank you to Podcast Guests - "connecting podcasters with great guests" - for becoming a silver supporter of Podnews today. Be like them. Visit https://podnews.net/update/subscribe for all the links, and to subscribe. Podtrac's March figures are out. #5 Wondery, #4 New York Times, #3 PRX; #2 iHeart and #1 NPR. Of note - NPR is now, once again, the leader in both US and global charts; PRX has a nice increase caused by merging with PRI. After launching it and then rolling back, Apple Podcasts now appears to have properly launched their new show pages, which work on the web (and, indeed, Android phones). This is our podcast page, and here is a typical episode page. Matthew Passy notes that the redesigned pages have removed links to the podcast's website, which is a disappointment. Our Editor wrote a piece recently on What Apple Should Do Next in podcasting, and suggested a subscription service for podcasts. 9to5Mac suggests that an Apple Podcasts Plus service could be a hit. We'd agree. The Australian Federal Election has been called on the day of the Australian Podcast Awards, Saturday 18th May. The Aus Pod Awards weren't consulted on this first, but they want you to know they're OK with that - and they've some information on how to vote, too. We'll be at Podcast Movement this year (as should you!) - let us know if we should catch up. Visit https://podnews.net/update/podcast-consumer-19 for all the links, and to subscribe. 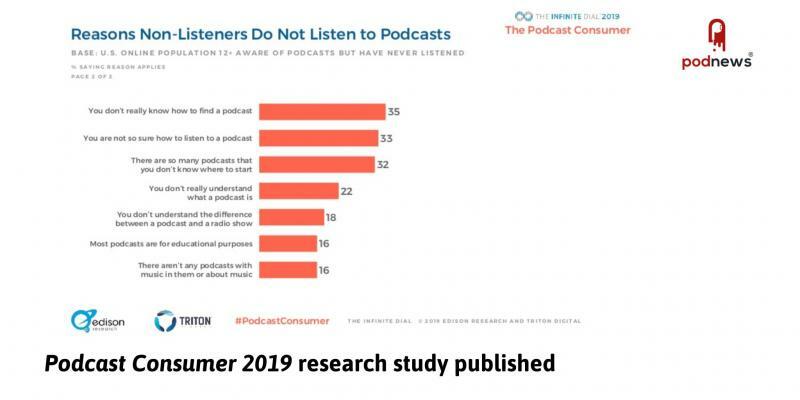 Edison Research revealed their Podcast Consumer 2019 study yesterday in a webinar. They have posted the full slide deck and video on their website. On the Twitter hashtag, Midroll highlight that 70% of podcast consumers are doing "nothing else" when listening to podcasts; Mark Asquith highlights that 75% of non-listeners believe that podcasts are "just not for them", and sees this as a marketing opportunity; and Evo Terra highlights that podcast listeners overwhelmingly use their phones for just that. Apple appears to have rolled-back their Apple Podcasts on the web product, which we reported on yesterday - the old pages are now appearing again. We did notice some errors using the service yesterday; perhaps it needed a little more polish, or maybe they're waiting until WWDC in six weeks. Meanwhile, 9to5Mac has discovered an icon for a rumoured-but-likely Apple Podcasts desktop app in an upcoming macOS release. The BBC is testing dynamically personalised programme trails within BBC Radio 6 Music, using AMillionAds. It's a beta trial currently, run on the BBC's "Taster" platform; but the possibilities on a signed-in service like BBC Sounds are obvious. (The BBC does not carry commercials in the UK). Notable quote: "the team did want to run it within [BBC] Sounds but that platform’s development path is so intense and they didn’t want to wait." NPR's Jarl Mohn spoke at the NAB Show about podcasting: "We believe in podcasting and we invest a lot of money in podcasting." 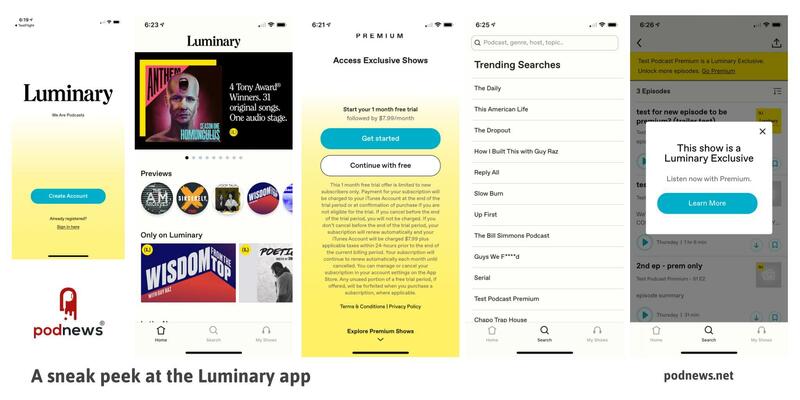 The subscription podcast app Luminary launches on April 23rd. Here's a peek at the iOS app, which is in beta (larger). As is clear from the trending searches above, the app also includes non-premium podcasts from other publishers. Amazon's Alexa speakers have unveiled a new "news" experience: it will now play continuous streams of news (including things like a live CNN stream, or additional news stories from NPR. Details are scant, and it isn't clear whether this is only in the US for now. A Boston TV station has featured RadioPublic in a segment called How to gain podcast listeners in any niche. The BBC's Brexitcast podcast was downloaded 1.35m times in March, says its producer. Castbox, the podcasting app, has added community features. Community is "a dedicated social feed within the Castbox app that lets podcasters post about their favorite shows and episodes, join trending conversations, and discover popular new content." Gopod·me is a new free service offering automatic links to podcast apps, allowing podcasters to promote their podcasts on all apps. Here's us on the service. Podnews also offer similar subscribe pages ; ours come with technical information to help podcasters, too. RadioPublic has launched a free podcast marketing course. A 21-day podcast marketing guide, it's available to anyone who claims their podcast on RadioPublic. Dr Phil is to launch a true crime podcast with Stitcher. "Listeners will travel inside the minds of the nation’s most notorious murderers through exclusive interviews guided by the expert forensic analysis of Dr. Phil." ABC Nightline’s investigative series The Dropout is turning into a TV show, reports The Verge. 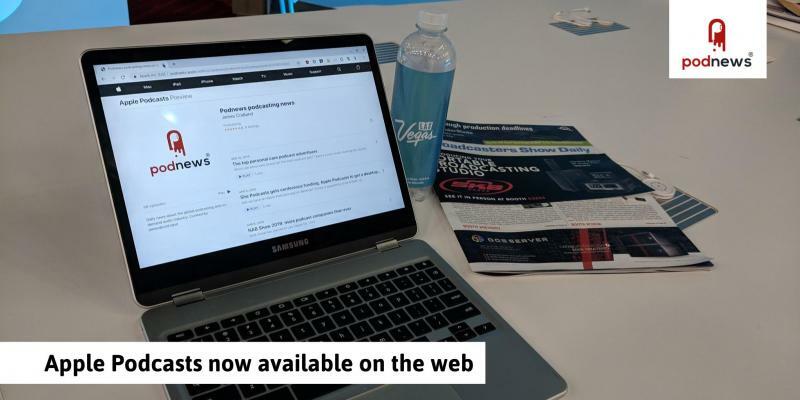 We linked to Futuri Media and the University of Florida's NAB Podcast Users National Survey Report 2019 yesterday, but the link we used may not have worked for everyone. This one does. 83% of US teenagers have an iPhone, and 86% plan to buy one as their next phone. New jobs today include a Head of Audio position at the Financial Times in London, and a Podcast Junior Partner Manager at Spotify's London headquarters. See below for the list in full. Reply All discovers the strange case of a man who's car stereo breaks every time he tries to play 99% Invisible . 2016 Mazda sedans are, it seems, incompatible with Radio Row In Beautiful Downtown Oakland California. Motherhood Sessions is a new podcast from Gimlet Media (and yes, it's available everywhere); it's hosted by reproductive psychiatrist Dr. Alexandra Sacks who talks with women about their struggles with motherhood. Case Closed , a true crime podcast series that doesn't leave you wondering whodunnit - is back for a new season, following the murder of Rusty Sneiderman. The first season achieved more than 1.8m downloads; every episode is already on Stitcher Premium. Jonny Gould's Jewish State is a Jewish and Israeli podcast from a UK broadcaster, ranging from Israeli HealthTech to Labour antisemitism, from the greatest pop music to Jewish comedy and from peace with Palestine to Holocaust testimony. Classified advertisers: our stats service is now working again after a short hiatus. We've added support for Blubrry's "subscribe via email" service in our podcast pages. Visit https://podnews.net/update/apple-podcasts-web for all the links, and to subscribe. Google Podcasts are also working on a web interface, but have yet to properly launch the product, and these pages don't appear in ordinary search results. Both Apple and Google products lack a front page, or a method of subscribing. Update: After we mentioned these pages, Apple appear to have rolled back their launch of this service, and these podcast pages now link to the old iTunes-branded page. Perhaps this is something they're planning for WWDC in early June. 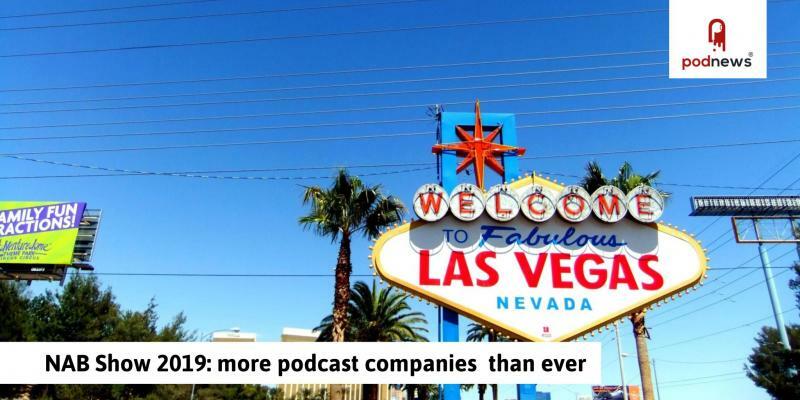 AllAccess reports on podcasting's presence at the NAB Show in Las Vegas NV, US. It covers many of the sessions, including one our Editor spoke at. The Athletic, a subscription sports website, has added podcasting to their offer. "We've introduced a premier audio experience as part of our subscription featuring more than 20 exclusive podcast shows (with more to come) hosted by The Athletic's world-class talent", says an email sent to subscribers. Podcasts are available on their website and app. The third annual PopCon Podcast Awards will take place at PopCon in Indianapolis IN. The awards are open to anyone who has a podcast with 5 episodes or more, and there is no cost to submit. The event also has a "live podcast stage", open to anyone, as well as a podcast marathon. It's on between June 7-9. A new iOS podcast app has been launched - Podcasts myTuner is a free and fully-featured app, including support for CarPlay and Apple TV. Particularly, it allows filtering of podcasts by country, language or category. It's from a team based in Portugal. A Little Bit Me With Ted Alexandro , from the stand-up comedian, has Tig Notaro on this week's episode. They talked about Star Trek, and the time Tig couldn't get Chrissie Hynde off the phone. Wondery's One Plus One is back for a new season: this time, focusing on Mexican artists Frida Kahlo and Diego Rivera. The podcast explores history’s most notable partnerships. Visit https://podnews.net/update/personal-care for all the links, and to subscribe. Which personal care brand ran the most podcast ads? Magellan can tell you in a new post focusing on this sector. Clue: they're such friends of the podcast industry, they also support this newsletter. Nomations for the Peabody Awards have been announced: the awards "honor the most powerful, enlightening and invigorating stories in television, radio and digital media." This year there are 11 podcasts and radio show nominees, including This American Life , The Daily , Ear Hustle and In The Dark . HelloCast launches today. It's one app to plan your episodes, manage your guests, track your sponsors, and even backup your files in one place. Here's a 7-day free trial, and 20% off whatever plan you choose - just let them know Podnews sent you. PRICES INCREASE TONIGHT to Podcast Movement 2019 — The world's largest conference and trade show for podcasters returns, welcoming nearly 3,000 podcasters from around the world this August. Register by midnight today (Wed) before prices increase! Podcast2book has launched: it's a way to turn an interview into a book to sell from your website. A BBC television presenter managed to play a podcast on air by mistake during a live TV show. Conveniently, the podcast was hers , but we're sure it was a proper mistake and not a way to market the podcast. The BBC's podcasts reappeared in Google Podcasts late last week, as we reported. We expressed doubt that it was deliberate; they've mostly disappeared, again, from the app. The BBC's press office haven't responded to our request for comment. Radio France's podcasts are no longer appearing in Google Podcasts. We learn they were removed before the BBC's action, though the broadcaster has declined to give us a statement. They've added a tag to their RSS feed barring Google from listing them. The CBC's podcasts are no longer appearing in Overcast, a popular iOS app. Everyone claims it's a harmless mistake and that they'll be back soon. Visit https://podnews.net/update/she-funding for all the links, and to subscribe. Will we have an Apple Podcasts app on desktop? iTunes is apparently to be broken up, says Pocket Lint. We're expected to see them at Apple's WWDC conference in early June. One Voice, One Mic is a new short documentary about podcasting, due to be released to film festivals later this year. It promises to take "an upbeat yet honest look at the rise of podcasting", as well as examining the future of the medium. Ahead of Luminary, French subscription podcast app Sybel launches today. It plans to be a subscription platform (€4.99 / US$5.60 a month). They raised €5m / US$5.6m at the end of last year. The service launches with an exclusive podcast, Gurus, focusing on true stories from powerful gurus around the world. Narrated by Mélanie Doutey, with an original music score composed by Nova Materia, it's produced by Engle. Email marketer AWeber has released an update for its Curate app, allowing you to automatically embed audio from podcasts within email. HTML5 audio is supported by Apple Mail and Samsung's default mail app. The Verge reviews the Rødecaster Pro. It uses the word "perfect" in the opening paragraph. The Daily from the New York Times is now being carried by more than 140 radio stations worldwide. "Worldwide", in this case, means one station in the US territory of Guam, with a population of 164,000. 3D Escape Room: Frequency - is an interesting idea - recorded in "3D audio", it's an interactive podcast where listeners play an innovative audio-based escape room in which they must navigate a series of puzzles within 60 minutes. Visit https://podnews.net/update/nab-19 for all the links, and to subscribe. Luminary is set to launch on April 23rd. It'll be available in just four countries (the US, UK, Canada and Australia). The NAB Show has kicked off in Las Vegas NV, USA. There are many different sessions about podcasting, the NAB Show Podcast will come from there, too. Many of the biggest names from podcasting are here. We're also here. The nominees will be announced for the British Podcast Awards today, Monday, at 6pm UK time (or your time). Hosted by the cast of No Such Thing As A Fish , the nominations will be announced live on their Twitter feed. Join the Listening Movement! — EarBuds Podcast Collective sends you a weekly email with a theme and 5 podcast episodes on that theme, each week curated by a different person. Listen with us! Episodes of true-crime podcast The Teachers Pet have been removed in Australia because of an ongoing court case. In London, the first Podcast Live happened this weekend, to great success. Another should be announced soon. Locked On, which has built its popular media enterprise upon short-form, daily local market podcasts for each NFL and NBA team is moving into major league baseball coverage beginning with the start of the 2019 MLB regular season. Locked On podcast listens doubled in 2018 to 5 million monthly listens. Nielsen, the audience measurement company, is ready to track podcast listening. “Nielsen clearly has a technology solution that could measure listeners. We’ve tested it, it works,” said Bruce Supovitz, SVP of national audio services, said on April 1st's edition of The Database . Meanwhile, Westwood One has released data showing the effectiveness of advertising across different platforms including podcasting for businesses that market direct to consumers. The rise of the UAE podcast culture is a piece in the Kaleej Times, including quotes from podcasters. How do I get more listeners to my show? You might not like the answer, says Rebel Base Media. The Rhino Podcast , the official podcast from "the catalog division of Warner Music Group", is focusing on Aretha Franklin for a short mini-series. Visit https://podnews.net/update/pizza-metrics for all the links, and to subscribe. Visit https://podnews.net/update/spotify-number-one-india for all the links, and to subscribe. Visit https://podnews.net/update/beer-brands-in-podcasts for all the links, and to subscribe. Visit https://podnews.net/update/google-dashboard for all the links, and to subscribe. Visit https://podnews.net/update/bbc-podcast-quadruple for all the links, and to subscribe. Visit https://podnews.net/update/700000 for all the links, and to subscribe. Visit https://podnews.net/update/laughable-android for all the links, and to subscribe. Visit https://podnews.net/update/blubrry-parcast for all the links, and to subscribe. Visit https://podnews.net/update/streamguys-rad-bbc-google for all the links, and to subscribe. Visit https://podnews.net/update/bbc-pulls-podcasts for all the links, and to subscribe. Visit https://podnews.net/update/podcast-length-return for all the links, and to subscribe. Visit https://podnews.net/update/google-podcasts-web for all the links, and to subscribe. Visit https://podnews.net/update/australia-smart-speakers for all the links, and to subscribe. Visit https://podnews.net/update/apple-next for all the links, and to subscribe. Visit https://podnews.net/update/patreon-strategies for all the links, and to subscribe. Visit https://podnews.net/update/patreon-boudet for all the links, and to subscribe. Visit https://podnews.net/update/gimlet-union for all the links, and to subscribe. Visit https://podnews.net/update/burgundy-iheartradio for all the links, and to subscribe. Visit https://podnews.net/update/radiopublic-new for all the links, and to subscribe. Visit https://podnews.net/update/sword-and-scale-ends for all the links, and to subscribe. Visit https://podnews.net/update/extortion for all the links, and to subscribe. Visit https://podnews.net/update/infinite-dial-2019 for all the links, and to subscribe. Visit https://podnews.net/update/google-podcasts-episode for all the links, and to subscribe. Visit https://podnews.net/update/spotify-vs-apple for all the links, and to subscribe. Visit https://podnews.net/update/apple-accessibility for all the links, and to subscribe. Visit https://podnews.net/update/apple-uturn for all the links, and to subscribe. Visit https://podnews.net/update/apple-no-episode-numbers for all the links, and to subscribe. Visit https://podnews.net/update/pandora-stories for all the links, and to subscribe. Visit https://podnews.net/update/rain-podcast-summit for all the links, and to subscribe. Spotify - growing the pie for podcasting? Visit https://podnews.net/update/spotipie for all the links, and to subscribe. Visit https://podnews.net/update/live-and-die-in-la-tenderfoot-tv for all the links, and to subscribe. Visit https://podnews.net/update/podcaster-worlds-most-innovative for all the links, and to subscribe. Visit https://podnews.net/update/podcast-live-launches-data for all the links, and to subscribe. Visit https://podnews.net/update/geico-advertiser for all the links, and to subscribe. Visit https://podnews.net/update/simpsons-do-do-de-doo-doo-de-de-doo-doo-doo-doo for all the links, and to subscribe. Visit https://podnews.net/update/quicky-australia for all the links, and to subscribe. Pandora's public podcast plans; Anchor's actual acquisition amount? Visit https://podnews.net/update/pandora-plans for all the links, and to subscribe. Visit https://podnews.net/update/root-of-evil-launch for all the links, and to subscribe. Visit https://podnews.net/update/apple-tos-podcast for all the links, and to subscribe. Visit https://podnews.net/update/google-podcasts-bootcamp for all the links, and to subscribe. Visit https://podnews.net/update/entale-ai for all the links, and to subscribe. Visit https://podnews.net/update/himalaya-launch-with-100m for all the links, and to subscribe. Visit https://podnews.net/update/spotify-gimlet-anchor for all the links, and to subscribe. Where are all the podcast archives? Visit https://podnews.net/update/podcast-archive for all the links, and to subscribe. Visit https://podnews.net/update/bpa19-returns for all the links, and to subscribe. Visit https://podnews.net/update/rode-competition-podcasters for all the links, and to subscribe. Visit https://podnews.net/update/podfest-himalaya-travel for all the links, and to subscribe. Visit https://podnews.net/update/werkit-survey for all the links, and to subscribe. Visit https://podnews.net/update/overcast-instant-search for all the links, and to subscribe. Visit https://podnews.net/update/meet-your-maker-paint for all the links, and to subscribe. Visit https://podnews.net/update/rodecaster-pro-multitrack for all the links, and to subscribe. Visit https://podnews.net/update/david-tennant-interview-podcast-new for all the links, and to subscribe. Visit https://podnews.net/update/economist-intelligence for all the links, and to subscribe. Visit https://podnews.net/update/audioboom-doubles for all the links, and to subscribe. Visit https://podnews.net/update/midas-q418 for all the links, and to subscribe. Visit https://podnews.net/update/marketing-facebook-podcast for all the links, and to subscribe. Visit https://podnews.net/update/anchor-money-making-podcasts for all the links, and to subscribe. Visit https://podnews.net/update/spotify-200 for all the links, and to subscribe. Visit https://podnews.net/update/podcast-launches-in-2018 for all the links, and to subscribe. Visit https://podnews.net/update/close-captioning-google-podcasts for all the links, and to subscribe. Visit https://podnews.net/update/bbc-spotify-exclusivity for all the links, and to subscribe. Visit https://podnews.net/update/us-radio-advertisers for all the links, and to subscribe. Visit https://podnews.net/update/ces-2019-samsung for all the links, and to subscribe. Visit https://podnews.net/update/smart-speakers-up-by-78-percent for all the links, and to subscribe. 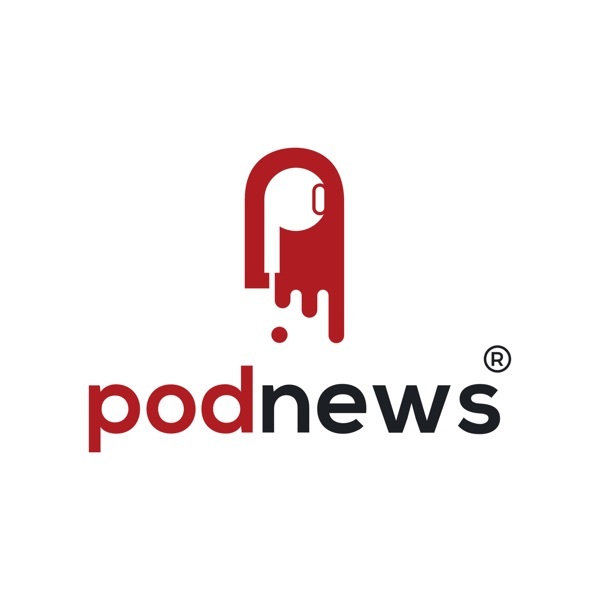 Visit https://podnews.net/update/what-next-launch for all the links, and to subscribe. Are ads coming to podcasts on Spotify? Visit https://podnews.net/update/spotify-podcast-ads for all the links, and to subscribe. Visit https://podnews.net/update/kanye-rogan for all the links, and to subscribe. Did a true-crime podcast nearly stop a conviction? Visit https://podnews.net/update/heavy-suitcase for all the links, and to subscribe. Visit https://podnews.net/update/2018-grew-up for all the links, and to subscribe. Visit https://podnews.net/update/mahnke-tips for all the links, and to subscribe. Where is podcasting moving fastest? Visit https://podnews.net/update/voxnest-podcasting-report for all the links, and to subscribe. Visit https://podnews.net/update/200000-new-2018-podcasts for all the links, and to subscribe. Visit https://podnews.net/update/android-podcast-apps for all the links, and to subscribe. Visit https://podnews.net/update/explain-to-family for all the links, and to subscribe. Visit https://podnews.net/update/just-listen for all the links, and to subscribe. Visit https://podnews.net/update/bbc-audio-drama-research for all the links, and to subscribe. Claims about RAD's privacy: are people right to be concerned? Visit https://podnews.net/update/npr-rad-privacy for all the links, and to subscribe. Visit https://podnews.net/update/analytics-spotlight for all the links, and to subscribe. Visit https://podnews.net/update/blubrry-npr-iab-certification for all the links, and to subscribe. Visit https://podnews.net/update/patreon-controversy for all the links, and to subscribe. Apple Podcasts glitch removing ratings? Visit https://podnews.net/update/apple-podcasts-glitch for all the links, and to subscribe. Visit https://podnews.net/update/nielsen-19 for all the links, and to subscribe. Visit https://podnews.net/update/npr-rad-goes-live for all the links, and to subscribe. Visit https://podnews.net/update/how-long-podcasts-radio for all the links, and to subscribe. Visit https://podnews.net/update/apple-and-google-podcasts-promotion for all the links, and to subscribe. Visit https://podnews.net/update/podcasts-go-live-in-pandora for all the links, and to subscribe. Visit https://podnews.net/update/radiodays-asia-announced for all the links, and to subscribe. Visit https://podnews.net/update/teachers-pet-arrest for all the links, and to subscribe.